After a summer where I’ve been worn out by heavy breakup albums, it’s really nice to hear an album that is about something completely different. 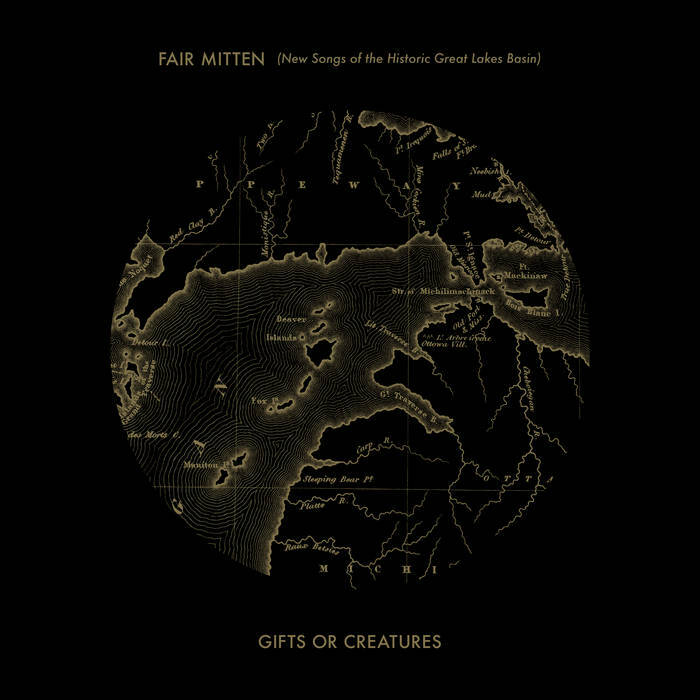 Gifts or Creatures’ Fair Mitten (New Songs of the Historic Great Lakes Basin) is exactly what the parenthetical announces: a bunch of songs about the history of Michigan and points surrounding. It’s a deep dive on a region for people who really hoped that Sufjan was going to do all 50 states, encased in unique indie-pop/indie-rock sounds. It’s only appropriate to address the lyrics first. If you didn’t grow up in the Old Northwest, you’re going to have dig deep into whatever you remember of your high school American History course: Pontiac’s Rebellion! Fort Dearborn Massacre! Canadian Shield! Fur trapping! Thankfully, GoC gives a lot of context in these tunes without turning this into Schoolhouse Rock. The focus is on the emotions of these places and events (“Grand Rapids Brakeman,” “Pontiac’s Rebellion,” “Conquest of the Old Northwest”), but the duo knows enough to give their listeners a leg up on what’s going on in the otherwise-oddly-specific tunes of this concept album. As I mentioned at the beginning: if you’re looking for something fresh for your ears, this is real fresh. Also fresh is the indie-pop/indie-rock songwriting. Three instruments are prominent: a specific dreamy keyboard, a lightly distorted electric guitar, and drums. With this unusual palette, the band wrings out all sorts of textures, from the pensive (“Trout of the Pines”) to the poppy (“Fort Dearborn Massacre”) to the icily expansive (“Manitou Passage”). But it’s in tunes like “Canadian Shield” the true power of their duo comes to light: there, the electric guitar and keyboard are so tightly meshed together that it sounds like one instrument. This is both an impressive sonic trick and a satisfying experience, as the sounds generated are attempting to reach an ideal the likes of which I have never heard or imagined. Again, if you’re looking for something novel, Gifts or Creatures have come up with it. Fair Mitten is an unusual experience at first, as Gifts or Creatures’ goals are hugely different than that of your run-of-the-mill indie band. In a way, they hearken back to the ideal of indie rock from the ‘80s: “sing your song, man. It doesn’t have to be about the same things as our songs, or sound like our songs; you’re part of us because it doesn’t sound like our stuff.” This isn’t stuff you’ll hear on the radio, and that’s great. It’s fantastic, unique, original work. Highly recommended.